Bev got me an iPod for my birthday. I requested it because the three television stations at the gym were becoming boring. On the fifth viewing of the day’s news headlines it starts to feel like Purgatory. 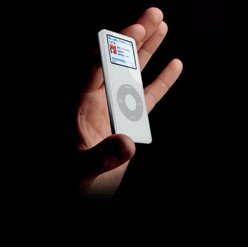 So with the iPod I can load up its memory with interviews, book reviews, travel documentaries, and sermons from some of my favorite preachers. I’ve now got Scientific American and Erwin McManus within a click away from each other. I took it on its maiden voyage this week. The time flies by now. My mind is carried away on interesting discussions and inspiring talks. Hearing Rick Steves talk about travel to Prague reminded me of our last European trip. Today I put my radio headset away in a closet. I no longer need that to enertain me while I sweat away. It doesn’t get much better than my iPod. Next Post → Can I help?